Internationally Recognized and Personalized Courses to Meet Requirment of Everyone. Single Window Solutions for Training, Exams, Study Abroad & Accommodation. Since 2009, GNS has been leading brand in German Language Classes in Jaipur and we are the best German Language Institute in Jaipur. We are the first dedicated German Language Institute in Jaipur and offering German Language classes, Training & Consultancy Services. Foreign Language Studio is only German Language Institute in Jaipur, which has conducted internationally certified exams of Goethe Institut in Jaipur. In this short teaching time more than 1550+ Students have learned German at Foreign Language Studio in Jaipur. Many of them are studying and working today in Germany, Switzerland, and Austria. Since 2011 continuously No. 1 German Language Institute with highest no. of Students. 100% Placement till date in various MNC’s in India as well as in Germany. Join our free German Language Classes. In these classes one could learn daily routine words with right pronunciation. Awarded 3 times Scholarshipby Goethe Institut, Germany for German Language Courses. Mr. Shamsher Ali- 4+ Years Exp., Taken German Language training from Berlin, Germany. Only German Language Institut in Jaipur, where most of faculties are taken comprehensive training from Germany. All faculties are certified from Goethe Institut. Learn German here with a help of audio-visual interactive tools. We Have wide range of German Language study material (German serials, German Films and German Podcasts). 100% Placement till date in various MNC’s in India as well as in Germany. So many leading German companies have visited us for campus recruitment. We are conducting also Group Discussion classes on every Saturday or Sunday. In these German classes we discuss on latest topics and themes of Germany and India. We also invite Native German experts from Germany as well as from Goethe Institut for special lectures, interactions and cultural activities. Ensure 100% Job Placement & Internship in India or Abroad and experience Global culture & lifestyle..
Infinite Opportunities for study and research in Abroad. To make travel more feasible, enjoyable and communication with world. Brings closer to different culture, communities & acts as real asset while traveling. Any bilingual or multilingual can earn three folds as compared to his counterparts in the same profession. Most of faculties are trained from Germany. Foreign language books, Dicts, CDs, DVDs and Maps at Publisher's Price. We want to globalize 3rd Generation professionals through most demanded foreign languages and culture training programs. To become India's most preferred foreign language community and culture exchange hub to deliver global exposure to professionals. We make every day, every class creative and interactive with the help of various multimedia tools, so that our student can enjoy language while learning. The best institute in town for German Language.The Training Program gave me the skills & confidence to start n new life in Germany. Very impressive and best institute in jaipur!!. 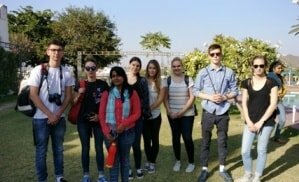 The Institute has very Nice view to give International exposure of German Language and Culture to the Indian Students. I appreciate their efforts. I am studying German Teachers Programm at GNS. I found it very impressive. Anyone who is searching for global opportunities, must visit here. Only the Institute in Rajasthan Specially for German Language can commit 100% result. Best Faculty, Training culture and own designed content. I ll recommend to all this Institute Specially to learn German. Thanks to GNS. Really the Best Institute. Best Faculties of Jaipur. I have qualified A1 within 30Days. Best Institute in Jaipur to learn German Language!! I'll recommend to all!! It's the Best Institute of German in Jaipur.. because it provided all facilities to the Students. The best teachers faculty make it easy to learn. I like very much to stay with gns sir. GNS Institute is a GREAT Institute if you 110% sure to make CAREER in German Language. Excellent Teaching, Highly Recommended, provides a total learning experience. i am studying German A1 level at G.N.S.it's best German institute in jaipur Increases my chances to study abroad. Friendly staff, nice environment, excellent teaching, best institution for German in Jaipur! Really the Best Institute of German Language. Good Teaching style and good way communication. Only the Institute in Rajasthan Specially for German Language can commit 100% result. We all love you G.N Saini Sir because you tell about German language as not a teacher but as a family member .Thank you for time to give us a best knowledge for German. I speak now good German, just because of Foreign Language Studio-GNS, Jaipur. Tanks to Mr. GN Sair for their personal attention. Its not Goethe Institut, but not less than Goethe Institut in Jaipur. I recommend to all who are willing to learn German. It's the Best Institute of German in Jaipur. Good Teaching style and good way communication. Only the Institute in Rajasthan Specially for German Language can commit 100% result. I'm glad I did this course. My tutor was very helpful and always gave great feedback. I have learnt a lot of new things, I hope to use this knowledge in Germany. I dont think the efforts taken here by the faculty are taken any where else. Honestly saying it is the best to learn any foriegn language specially german!! In one word its prodigious! GNS is one of the best institutes in India to learn German. Such a friendly environment with experienced and very supportive faculties. Foreign Language command is easy with help of GNS. Best institute for german language in jaipur and i improve my skills in german language in short time. Good teaching and supporting staff providing a good environment for learning german easily. I am German student of KV2. 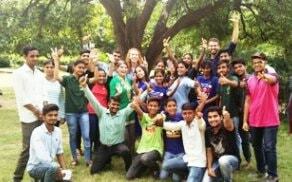 Rajasthan best german institute with good atmosphere. A smooth experience till now. From registeration to classes conducted to doubts asked, GNS has been cooperative in all. Yet to complete A1 level though. It is really best institute in Rajasthan. Superb experience. An amazing place to learn german. GNS helped me to learn GERMAN language. Its a very good place where u can enhance your skills. Do You Have any Query regarding Free Demo Classes, Language Courses and Your Nearest Branch?